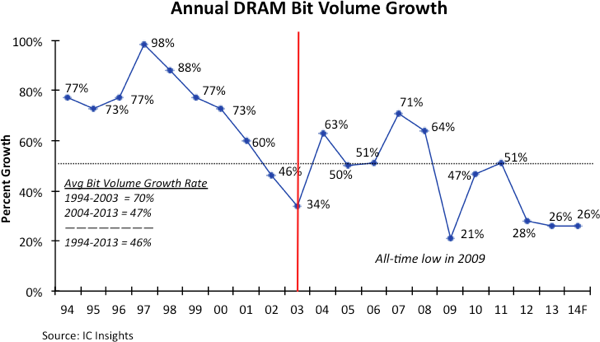 IC Insights forecasts the average annual DRAM bit volume growth forecast to drop from 83% in the 1995-1999 time period to only 36% from 2010 through 2014. A worldwide economy mired in recession stunted DRAM bit volume growth to an all-time low of 21% in 2009—quite a contrast from 1994 to 2000 when annual bit volume growth was above 70% (Figure 1). With recovery from the recession in full swing in 2010 and DRAM suppliers transitioning to ≥1Gb DRAMs, bit volume increased 47% that year and an additional 51% in 2011. But the fairly strong bit volume growth was short-lived. In 2012 and 2013, bit volume grew just 28% and 26%, respectively, due to a decrease in standard PC shipments (the primary application for DRAM) and no major operating system upgrades to boost the average DRAM memory content in these systems. IC Insights forecasts a similar scenario will play out again in 2014—low DRAM bit volume growth due to declining shipments of standard desktop and notebook PCs. The slowdown in PC shipments has considerably impacted where DRAM bit volume is being consumed. The desktop/notebook computer segment represented less than half of total DRAM bit volume for the first time in 2012 and its share is forecast to fall to 31% in 2014—half its marketshare from 2010. Meanwhile, DRAM bit consumption from mobile and server applications has grown in recent years. In 2014, mobile systems are forecast to become the largest application for DRAM bit volume, surpassing the desktop/notebook segment, which has long been the essential driver for DRAM bit consumption. DRAM bit volume in the server segment has shown a nice increase in recent years. Between 2010 and 2014, three generations of Intel server processors have been introduced with the 22nm Haswell (the most current offering) featuring up to 15 cores and integrated high-speed memory controllers that can support up to 6TB (terabytes) of DRAM. Intel’s Haswell has the capability to address three times as much memory compared to the company’s 32nm Westmere processor that was shipping in 2012 and five times as much memory compared to its 45nm Nehalem processor in 2010. Though the number of server unit shipments may not be growing rapidly, DRAM bit volume for these systems is currently enjoying a strong surge.